forsaking those who are mindful of the Buddha. The person of true and real shinjin. This Light of Amida dispels the darkness of the minds of sentient beings giving them the capacity of seeing themselves as they really are, that is with no chance of attaining Buddhahood by any self power practice and of perceiving the salvation of Amida as true and real, capable to liberate them forever from birth and death. This twofold vision is the effect of Amida’s Light into the minds and hearts of the devotees. This is what we feel, understand and accept when we become open to the Light of Amida, that is when we receive shinjin. 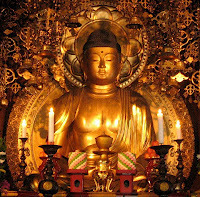 The Light of Amida also protects us from wrong understanding of the teaching. False teachers can’t influence us and we’ll never distort the essentials of the Jodo Shinshu Dharma in our presentations. The Light of Amida is always sent toward beings in all the corners of the universe – “hundred thousand kotis of nayutas of Buddha-lands”. “A thousand kotis” is a symbol for infinite, “kotis” being an incomprehensible number, beyond our capacity to calculate. “Buddha lands” are all the places and worlds in the universe as it is considered that each world system is governed or taken care of by a Buddha who appears and preaches the Dharma there. Some world systems are lower or higher on the spiritual evolution scale while some are especially manifested by the Enlightenment and Vows of great Buddhas, like the Medicine Buddha (Yakushi Nyorai), Green Tara’s Land, etc. The devotees of each great Buddha who owns a special Pure Land will go there through various practices that make them connected with that specific place and once born there they continue their practice under the guidance of that Buddha. But in all these Pure Lands, the Light of Amida is also seen and praised, especially by the Buddhas who govern those lands and who show it to their devotees. This is because all Buddhas are aware of the wonderful method of Amida’s salvation and recommend it to all beings. pratyekabuddhas, and bodhisattvas praise and glorify it in the same way”. So, Amida’s Infinite Light is a transcendent manifestation capable to go anywhere in the universe. It can be seen by beings of superior capacities, humans or non-humans, and felt in the hearts and minds of the believers in the aspect of shinjin. Amida’s Light is a permanent presence upon beings everywhere, opened or not opened to it. Through his Light Amida tries permanently to influence beings and make them accept his salvation contained in the Primal Vow (18th). It is like an immense magnet attracting all beings to him. Some become opened to it sooner while others will do so in the future. Amida will continue sending it until all hells are empty and all beings will become Buddhas. Amitayus means „infinite Light” while Amitabha stands for „infinite Life”, the two aspects of Amida Buddha. Manifestations of Amida Buddha which accords with the particularity of each being. Read my article “The Ten Benefits in this life of a Nembutsufollower”, especially the fourth and sixth benefit. See my commentaryon the 17th Vow.